We know one of the most important aspects of running a business is having the right answers available when needed. Over 40 thousand partners visit our support page every month, and it’s our priority to give each one specific and timely help. We have been focused on making the partner-support experience as easy-to-use as possible, and that effort was recently awarded with this year’s Technology Services Industry Association Star Award for delivering world-class, proactive support services to partners. We’re proud to support our partners in any way we can, and we will continue to improve the support experience going forward. The best insights into how we can improve come from you. With that, we’ve taken your insights and feedback and created new support experiences. 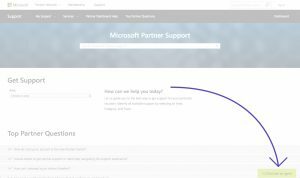 Click-to-chat option: The click-to-chat option has been added to most pages throughout the Microsoft partner website. Wherever you are, one-on-one help is just a click away. Support link in the primary site navigation: Support information can be found quickly with an easy-to-find support link in the primary website navigation. Enhanced support categories: To help you quickly search relevant topics and find answers fast, we have addressed the most frequently asked questions from partners and created improved support categories where partners can attain additional, specific support in one location. 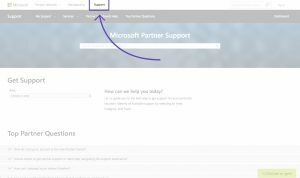 Logo Builder tool: Partners now have easy access to the Logo Builder tool, which allows you to create a partnership logo or – in the case of Silver and Gold competency partners – can print a verification letter to certify your Microsoft partnership.